In the fourth quarter of 2018 the major U.S. stock market indexes experienced a severe correction, with index value declines approaching 20%. After almost 10 years of bull market, that drop let investors understand the pain of a steep market decline. One of the head clearing benefits of a correction is that one will make you focus on your portfolio management strategies. 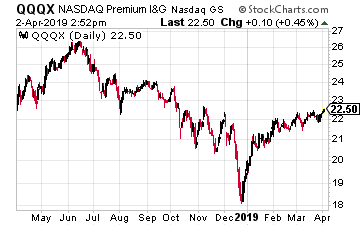 As an income stock guy, I recommend and practice the strategy of using stock price drops as buying opportunities. When the share price of a high quality dividend stock drops, that is the time to add shares, which will increase the income stream and average yield of that holding. The point is that I recommend buying shares during a market correction. Before a correction will be a period of high stock values. This is the time to unload shares of income stocks where the ability of the underlying companies to continue to pay the dividends may be challenged, especially if the economy slows or goes to negative growth. With the market back up, here are three stocks that I have recommended my subscribers sell, so that we aren’t holding them when the next stock market correction arrives. The Nuveen Nasdaq 100 Dynamic Overwrite Fund (QQQX) is a closed-end fund that seeks attractive total return with less volatility than the Nasdaq 100 Index by investing in an equity portfolio that seeks to substantially replicate the price movements of the Nasdaq 100 Index, as well as selling call options on 35%-75% of the value of the Fund’s equity portfolio. The fund employs a covered call strategy on the tech stock heavy Nasdaq 100 Index. Selling the call options allows the fund to have a current 7.4% yield. My sell recommendation was based on there is too much downside risk to the fund in a steep market correction compared to the income and capped upside that comes will doing a buy/write option strategy. 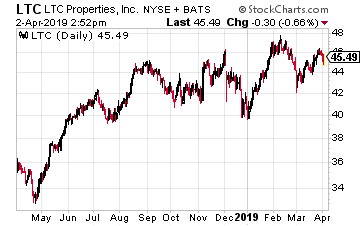 LTC Properties, Inc. (LTC) is a real estate investment trust (REIT) that owns a portfolio of seniors housing and skilled nursing properties. The properties are leased out to independent operators. For its 200 property portfolio it has 31 operating partners. While LTC is a very well run healthcare REIT, its commercial real estate sector is facing a lot of headwinds. Operators are being squeezed on insurance reimbursement or skilled nursing services. Labor costs are increasing rapidly. There have been several operator bankruptcies over the last several years. For LTC as an investment, the 4.15% yield does not get close to covering the risk. TPG Real Estate Finance Trust Inc. (TRTX) is a relatively new commercial real estate finance REIT. The company came to market with a July 2017 IPO. This type of REIT makes mortgage loans on commercial properties. The company came out the gate fast with nice dividend growth. However, over the last year TRTX has not increased the dividend and free cash flow is barely covering the current dividend rate. 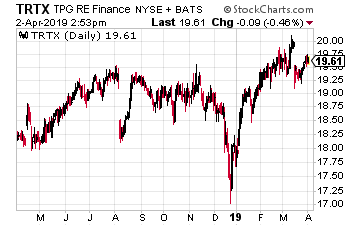 There are other commercial finance REITs with yields similar to the 8.7% paid by TRTX with much stronger dividend coverage and long term track records. TRTX does not bring any added value to a diversified high-yield, income stock portfolio.